3-D printing company MarkForged refused to sell printers to gun group. Does it matter? 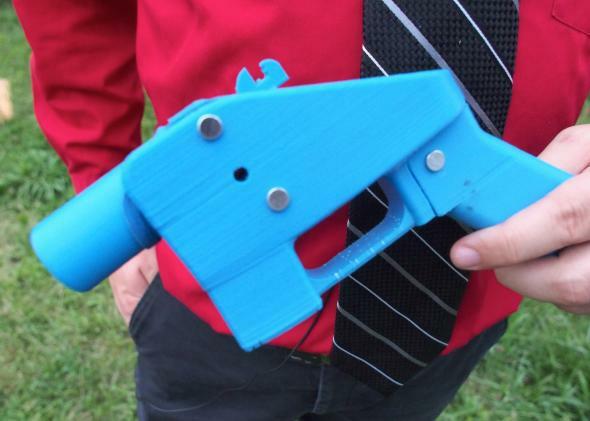 Can a 3-D Printing Company Stop People From Printing Their Own Guns? No guns for you, 3-D printing company tells gun group. This post originally appeared in WIRED. The age of 3-D printing in carbon fiber has hardly arrived. But the controversy over 3-D printing carbon fiber guns is well under way. Starting in the second half of last year, 3-D printing startup MarkForged has been shipping the Mark One, a device it advertises as the world’s first 3-D printer that prints carbon fiber; The Mark One digitally fabricates objects in a material as light as plastic and as strong by some measures as aluminum. But one group isn’t about to receive its Mark One order: Defense Distributed, the nonprofit political group that invented the first fully 3-D printed gun nearly two years ago. Defense Distributed founder Cody Wilson says he pre-ordered the Mark One about a year ago for $8,000, but was told last Friday in a phone call with a MarkForged salesman that the company refuses to sell him one, citing terms of service that disallow private citizens from using the machine to make firearms. So instead, Wilson is offering what he describes as a “bounty” to anyone who can get him MarkForged’s new carbon fiber printer. In a statement to Wired, MarkForged cited terms of service that “limit experimentation with ordnance to the United States Government and its authorized contractors.” In fact, the company’s terms of service page doesn’t include that statement. But it does reserve the right for the company to refuse sale to anyone, even after an order is placed. Wilson, of course, isn’t satisfied with a refund. Defense Distributed’s radically libertarian founder—who has said he seeks nothing less than to prove all government regulation irrelevant in the digital era—accuses MarkForged of denying Defense Distributed its printer based on hypocritical politics, given that it’s willing to let its machines be used to make weapons for the U.S. military and defense contractors. MarkForged is far from the first company to try to disassociate itself from Defense Distributed’s anarchist, gun-loving mission. Indiegogo pulled the group’s initial fundraising campaign in 2012. 3-D printer maker Stratasys refused to rent a printer to the group after it learned what it was being used for. 3-D printing websites like Thingiverse and Shapeways have banned gun components from their collections of CAD models. Even Fedex and UPS have refused to ship a computer-controlled milling machine that Defense Distributed began selling late last year. Those obstacles didn’t stop Wilson’s gun-making organization from creating and test-firing the Liberator, the world’s first fully 3-D printed firearm, in May, 2013. If the group gets its hands on one of MarkForged’s carbon fiber 3-D printers, it could potentially demonstrate homemade, lethal weapons that are far more durable and practical. MarkForged advertises that its material—plastic polymer laced with carbon fiber strands—is 20 times stiffer than typical 3-D printing plastic and five times stronger, with a higher strength-to-weight ratio than aluminum. Printing a gun on one of MarkForged’s new carbon fiber printers—if Defense Distributed does obtain one—would be a bit of a stretch from the group’s original goal of making a gun that anyone could download and create on a cheap printer with a click of a mouse. But as 3-D printing evolves and becomes more mainstream, carbon fiber printing is sure to become more accessible, too. In a marketing video for its new printer, MarkForged founder Greg Mark almost seemed to acknowledge the company’s lack of control over how its customers will use its machines.